Tracey L. Thompson's paranormal adventure Fatropolis is being praised by Fat Heffalump (Living with Fattitude) and Virgie Tovar. "The story follows Jenny, a super sized woman who falls through a portal in a dressing room in Manhattan that takes her to an alternate universe where fat is the norm and thin people experience the sort of oppression and aggression that I've known as a fat person all my life," Tovar writes. "She meets cute boys and takes lots of baths and has lots of donuts. What's not to lurve?" While enjoying the story, both Tovar and Fat Heffaump also appreciate the way in which the novel "gets deep and real," as Tovar puts it, about fat hatred. "Fatropolis is about discovering that fat is not a dirty word, and asking questions of the dominant cultural paradigm we live in today," Fat Heffaump writes. "...Tracey Thompson manages to weave in a whole lot of fat activism 101 to this story and does so without it being preachy or pushy....I say get out there and give it a read, regardless of where you are on your fat liberation journey." Read Tovar's review here, and Fat Heffalump's here. Check out and share an excerpt from the novel via the BookBuzzr widget below. 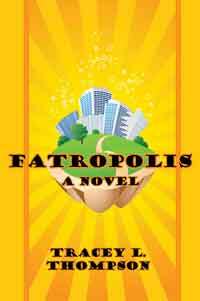 Spark your own or others' discussion of the novel Fatropolis with the new Book Discussion Guide available at the Pearlsong Press website. Fatropolis is fiction, but the free PDF contains a list of resources providing facts about weight, health, and culture and guidance in creating your own personal Fatropolis. Links to author Tracey L. Thompson's website and an hour-long conversation with the author recorded upon the novel's publication last fall are also included. Download the PDF directly here, or visit the book's page at the Pearlsong Press website (www.pearlsong.com/fatropolis.htm). Enjoy -- and please share! Laurie's Paranormal Thoughts and Reviews is featuring Tracey L. Thompson's novel Fatropolis and an "interview" with Dotty O'Flannigan, a character from the book. Read the interview here, and be sure to enter the raffle for a free copy of the PDF ebook! Browse an excerpt from the novel below. More info on Fatropolis is at www.pearlsong.com/fatropolis.htm.